Book Castle Publishing 2007. �.99. ISBN 978-1-903747-88-9. 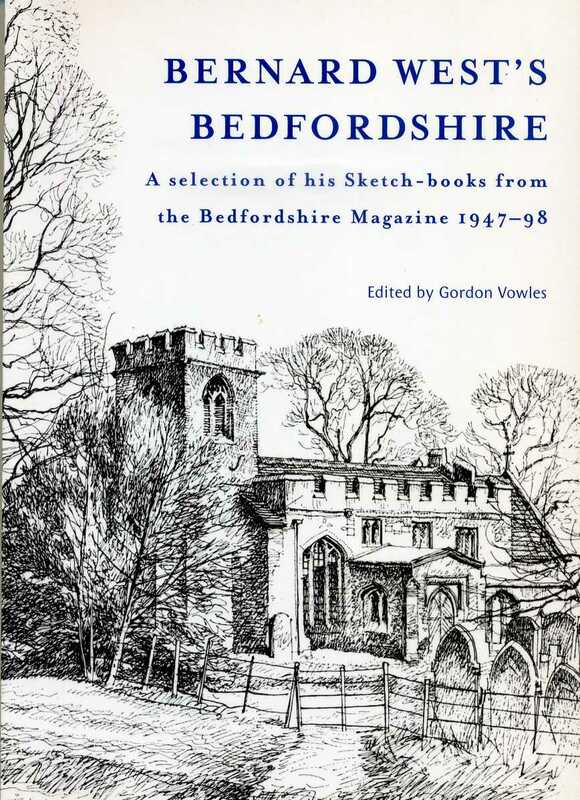 Those who remember the Bedfordshire Magazine (the A5 size publication 'now sadly defunct' and not the more recent County Council's coloured publication of the same name) will have fond memories of Bernard West's Sketch-books. These were pen and ink drawings of Bedfordshire places (more of the north rather than the south of the County because to a busy Bedford architect it was easier to find subjects nearer home) accompanied by a brief but interesting commentary representing his interests in natural history and conservation, on which subjects he was not afraid to express his views. From the summer of 1947 until the spring of 1998 he contributed to all but two of the quarterly volumes making him the longest and most prolific of the Magazine's contributors. Bernard died in January 2006 and this volume of the best of his sketches and contributions was produced by the local history group of his home village, Willington (of which he was an inaugural member) as a commemorative volume. It is edited by Gordon Vowles, also a Willington resident, and a past editor of the Bedfordshire Historical Record Society. Gordon has put together a selection of Bernard's best, or perhaps most representative work, arranged alphabetically by place. Not every village in the County is represented (a friend of mine in Clapham was very indignant that his village had been omitted) but those chosen are a varied, mixed and interesting collection. The pictures are well reproduced at their original size and the volume is well laid out in a good clear format with the commentary on one side of the page with the picture facing it on the other. The book also contains an interesting and lively biographical sketch of Bernard West, complete with photograph, by Robin Chrystal the son of Sandy Chrystal his partner in the firm of Chrystal & West, architects. It is altogether a delightfully produced volume well worth its price of �. 99.